Really beautiful 1950’s vintage coat! Looks like it has never been worn! Made from 100% cashmere, so very luxurious to wear, not to mention soft to touch! Slanted pocket either side, plus two faux pockets to the front. The buttons are just fabulous! The crystal detail is just so beautiful and more importantly, not one crystal is missing! As if this coat wasn’t elegant enough already, the collar and pockets have all satin trimed edges! 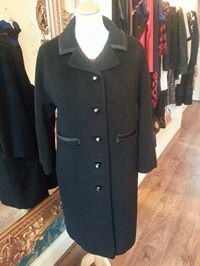 This entry was posted in New In Stock, News and tagged 1950's coat, cashmere coat, crystal buttons, Mullingar, New To You, vintage 50's. Bookmark the permalink.